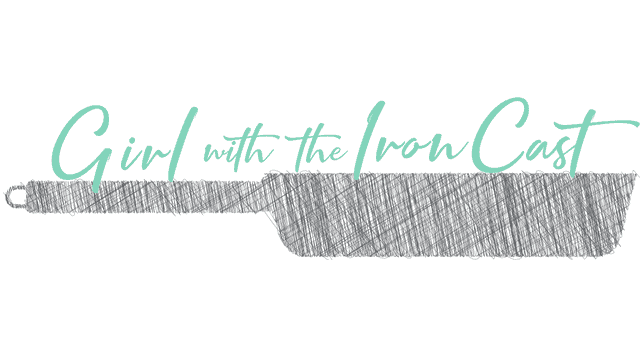 What’s Thanksgiving without a Turkey?…Not Thanksgiving! Obviously the turkey is always the center of attention so we need to make sure it’s on point. 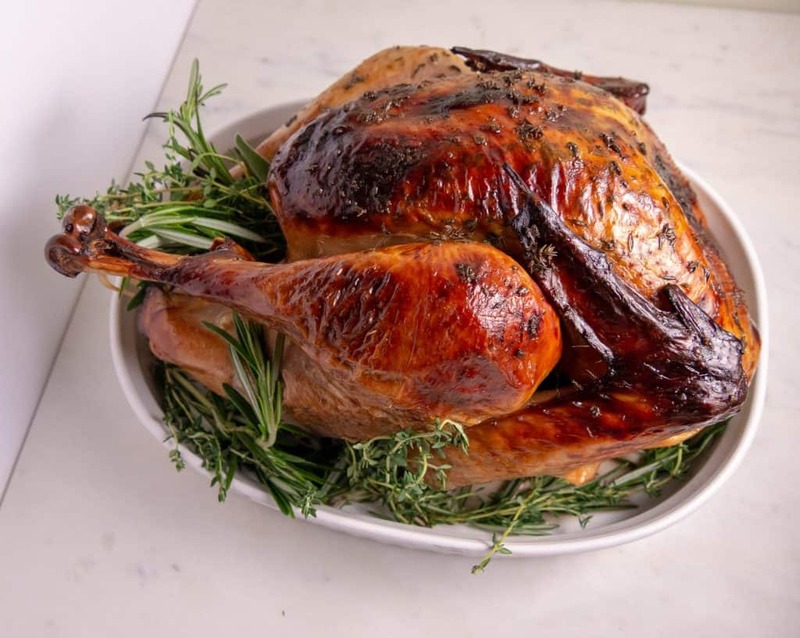 There are so many ways to prepare a turkey: wet brine, dry brine, smoke, deep fry, roast, etc. the possibilities and ingredients are endless. The past 3 years I have been wet brining my turkey. A wet brine allows the turkey to soak up salty water and other flavors overnight to give you some of the juiciest turkey you have ever had. This recipe is adapted from my culinary idol, Alex Guarnaschelli (she’s the bomb). There is a lot of things you need to think about prior to starting the turkey such as: how many people are coming over, what size turkey are you getting, and how long it takes to defrost if frozen. 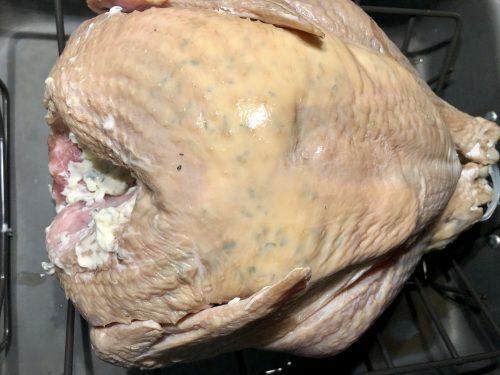 There are so many different size turkeys that you can easily google according to size how long it takes to thaw, but brining also helps in the defrosting process. You will need a large enough pot to brine the turkey in, you don’t necessarily need a fancy metal pot, I’ve actually heard of people using (clean) buckets or coolers. Make sure you submerge the turkey breast side down and that you allow the cavity to fill with the water. Then it’s time for the brine to work its magic. Next comes prepping the turkey. Remove the turkey from the brine and remember the body is filled with water so be careful and pour it out before putting on the rack. Dry the whole turkey with paper towels including the inside. Next comes the good stuff, the herb butter! Using a mix of butter, fresh sage, fresh thyme, and lemon zest mix it up and start stuffing! Sometimes it’s hard to get under the skin so before coming at it with the butter, use your fingers or carefully use a spoon to loosen the skin. Add the herb butter under the skin and I also rubbed some on the outside after. 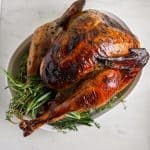 Keep an eye on the turkey because with this brine the skin is going to crisp up fast, if it starts getting too dark you can make a foil tent to allow the turkey to keep cooking without burning the skin. 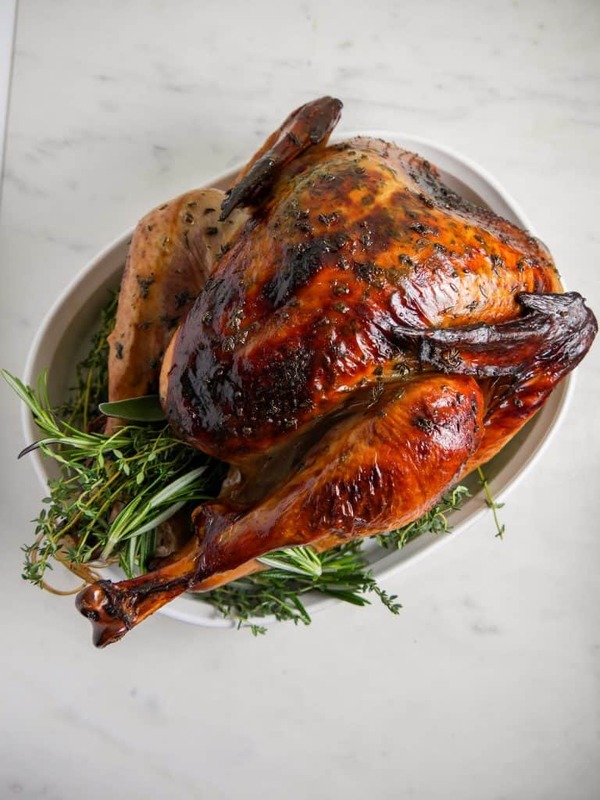 The crispy skin that this brine gives the turkey is the best part (insert drool emoji). I also turn the roasting pan every hour to ensure it gets an even cook. Due to the salty nature of the brine, careful making gravy from the pan drippings. I do use some in my gravy, but only a few tablespoons. 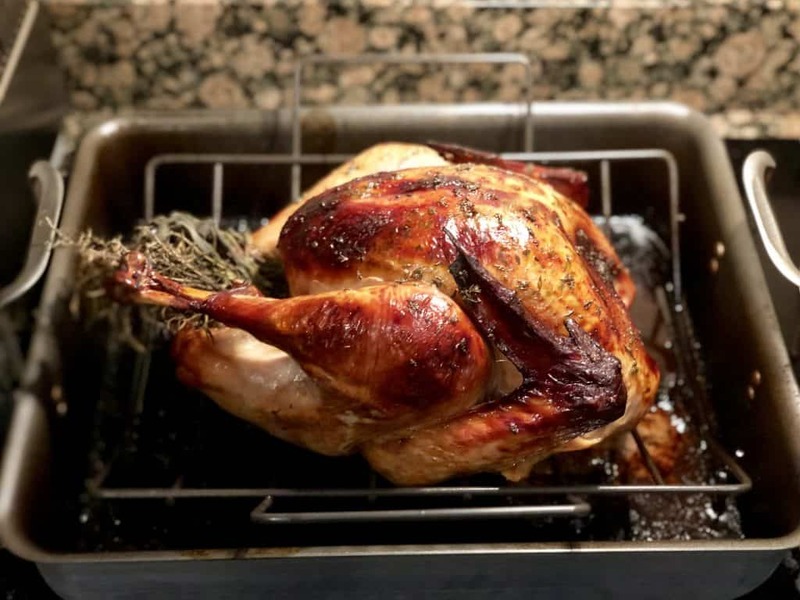 I’ve had family members call this the best turkey they have ever had and I hope your family loves it too. 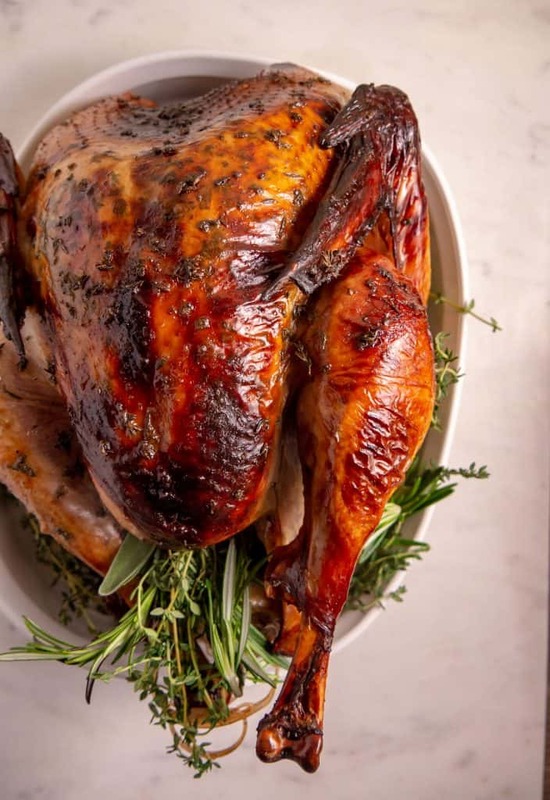 Things you’ll need: A large brining pot or bucket, medium bowl to mix brine ingredients, pot to boil water, roasting rack + turkey pan, small bowl to mix herb butter. 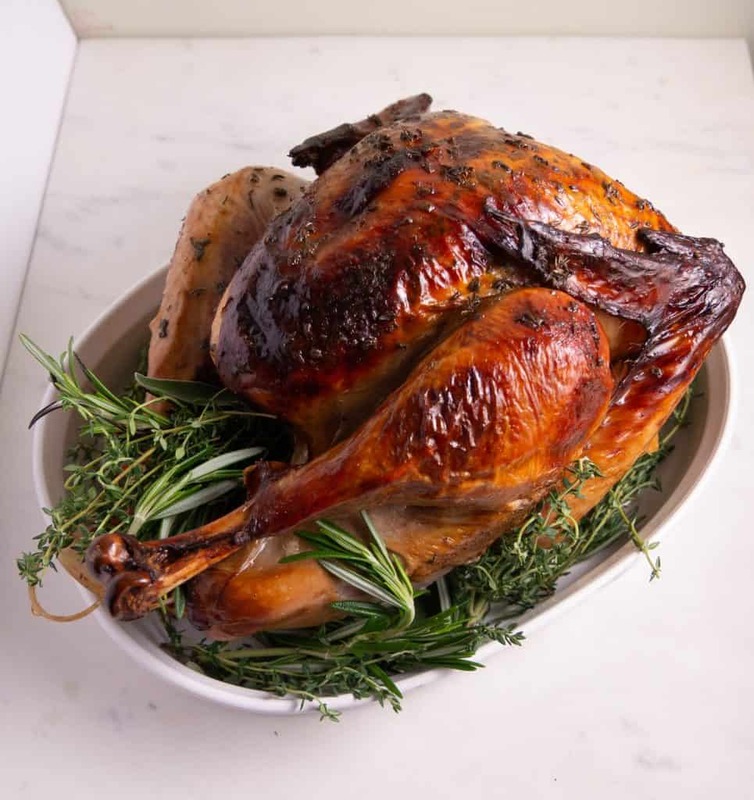 The juiciest brined turkey perfect for your Thanksgiving this year. In a medium pot, boil 3 quarts of water. Add to the large mixing bowl CAREFULLY and mix in the salt until blended. In the same bowl, add the molasses, soy sauce, honey, red pepper flakes, sage, thyme, garlic, and mix until blended. Add the remaining 3 quarts of cool water. 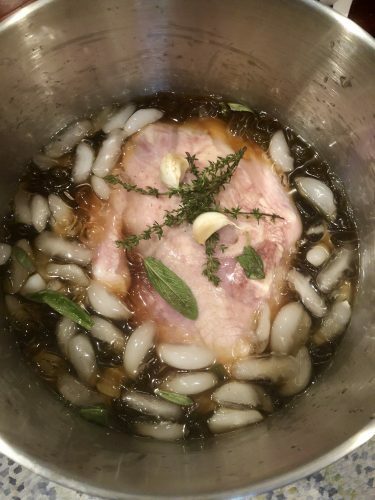 In your brining pot or large bucket/cooler, add the ice. Then pour the brine mixture over the ice and blend. Place the turkey into the pot breast side down and push the bird down to allow the cavity to fill with the brine mixture. Cover the cooler and let the bird sit overnight for about 12 hours. The next day, remove the bird from the brine and dry it fully inside/out with paper towels. Place bird on roasting rack+ pan. 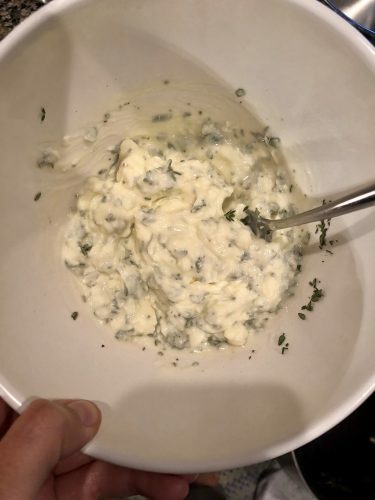 Assemble the herb butter in a small bowl. Using your fingers, by the neck loosen the skin on the turkey so you can get under it and insert the herb butter. You can also use the extra herb butter to rub on the outside as well. Put on the lower rack and roast until the internal temperature of the turkey on the thickest part (usually the thigh) registers 165-170 degrees. I test multiple spots to ensure it is fully cooked. Depending on the size of the bird 3 1/3-4 hours (you can google time based on lbs). The skin tends to brown quickly so if you see the skin getting too dark you can tent with foil while it continues to cook. Remove turkey and transfer to a cutting board or serving dish and allow to rest for 15 minutes before carving/serving. Thickest part of turkey should register to 165-170 degrees, test multiple spots to ensure even cooking. 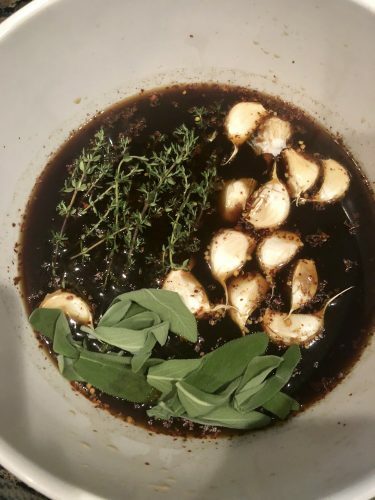 Can you make turkey gravy from this recipe?? Basically, after I made this turkey for my husband’s family last year. I’ve been signed up by my own mother-in-love to make the turkey every year from now on. I don’t mind, it was pretty darn good!!! I’ve never had turkey that wasn’t dry, this was the juiciest turkey I’ve ever had. I was advised to turn the pan every hour so the turkey would cook evenly and it definitely helped.